Does ESSA reach all students who are attending school in a corrections facility? Are there any categories of students who might still be left out of the statute’s provisions? It depends on how a state classifies the educational services provided to students in juvenile justice facilities, and how you define “correctional facility.” Youth can be involved in many parts of the juvenile justice and criminal system: juvenile detention, which are short-term facilities, juvenile correctional facilities, which are longer term commitments, and adult facilities for those youth that are charged of adult crimes. In our brief, we focus specifically on those youth that are placed in longer term juvenile correctional facilities. For these facilities and students, whether the state views the educational services as a school, program, or some other category could impact how they are held accountable and whether ESSA reaches them. In some states, these services are part of the overall state education accountability system; for other states, accountability for these services are distinct from traditional public schools; and in some states, these services are held accountable by the juvenile justice or other youth-serving system. Our belief is that regardless of the state’s structure, students in juvenile facilities should not be left behind. ESSA gives states the flexibility to rethink how juvenile justice schools might be included in a state’s accountability plan in a way that takes into account the unique context of the facilities and student population. If a state leader wants to improve accountability strategies for juvenile justice schools, what are your top recommendations? 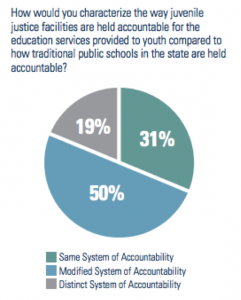 Our brief provides education and juvenile justice leaders with key questions to consider as they think about accountability for all public schools, inclusive of juvenile justice schools — whether states are just getting started with thinking about this population, or they are ready to dive deeper in assessing their current policies and practices. The three priority areas we think stakeholders should think about are: collecting and sharing data across agencies, defining their accountability system, and developing appropriate accountability measures. 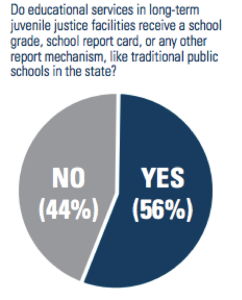 For example, in the accountability measures section, we provide a table with measures that align with the four required indicators under ESSA, and key questions to think about as states contemplate the most appropriate measures for this population of students. We hope that the brief helps states facilitate a dialogue among the diverse stakeholders involved in providing and improving educational services in juvenile justice facilities. Do you think that compliance with ESSA is our solution to low academic achievement for students attending school in juvenile justice facilities ? Are there problems you’ve identified that the federal statute can’t solve? But ESSA is not the single solution. In order to improve education outcomes for youth in the juvenile justice system, we must also consider how to ensure that facilities are equipped with quality educators and an aligned curriculum, and that states can help youth successfully reenter upon exiting a facility and reconnect them with education and/or employment in the community.